As a tribute to the man who has played such an important role in the club recently - there is a statue of former club owner Jack Walker to be found behind the Blackburn End. As an away fan - you'll find yourself seated in the Darwen End. This is typically an allocation of 4,000 tickets (around 3/4 of the stand), but in the occasion demands it the whole of the stand can be made available. The facilities are good our main grumble being the legroom provided being tight as there is not a lot of space between the rows of seats. At half time you'll be able to get yourself the usual burgers, pies, hot dogs and chips as well as a beer. Probably less of you travelling from this direction - but turn of the M6 at junction 30 onto the M61. Leave the M61 at junction 9 onto the M65 which takes you towards Blackburn itself. Leave the M65 at junction 4 (A666) and follow the signs for Blackburn. From the M6 turn of at junction 29 onto the M65 towards Blackburn itself. Turn right at the first set of traffic lights you hit and you'll find Ewood Park on the right hand side about 1 mile down the road. Take the M62 onto the M66/A56, and then onto the M65 towards Blackburn itself. Turn right at the first set of traffic lights you hit and you'll find Ewood Park on the right hand side about 1 mile down the road. Greg Miller has dropped us an e-mail, and says 'Ewood Park is signposted from junction 4 off the M65 (which leaves the M6 at Junction 29)'. The nearest railway stations are at Blackburn (1.5 miles) and Mill Hill (1 mile). Jump on any bus from the Blackburn town centre heading for Darwen and it will drop you off 2 minutes from the ground. Street parking within a short walking distance is advisable. There are a few car-parks off the A666 Bolton Road at Darwin High School and at The Fernhurst pub. Parking only available at the ground if pre-booked. There are extensive secure private parking facilities immediately adjacent to the stadium, allowing for up to 800 vehicles. In contrast to most of the pubs in the vicinity of Ewood Park, the The Fernhurst Arms is located at the away supporters end of the ground, on the A666 (Bolton Road), and welcomes away fans. This is a large pub, with a good restaurant area (we didn't have a chance to try the food) and Sky / Setanta sports. The Fox and Hounds is located directly across from McDonalds, and welcomes most away fans apart from high profile local derby games (Burnley, Man Utd, Bolton, etc) but generally speaking, away fans are welcome. Although to guarentee entry, it would be best to cover your club colours. Like the White Bull this pub has a friendly atmosphere and good banter. The Havelock Inn is located on Havelock Street, and offers reasonably priced beer and food. It should also be noted, that it gets very busy due to its close proximity to the main car park. The Aqueduct Inn is strictly home fans only and best to avoid. They have bouncers on the door who will listen for accents, look for colours, and they pretty much know their regulars anyway. 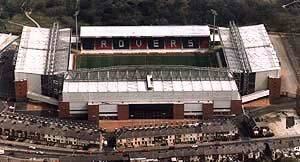 The Ewood Arms is located on Bolton Road, and again is a home fans only pub. There is a McDonalds restaurant within a two minutes walk of the ground. If you are a registered user then you can login, and create your own personal review of Blackburn Rovers Football Club - Ewood Park. These reviews can be private or public.